The presenter, Andrew Erickson, is the lead mentor of Los Alamos High School FRC Robotics club 4153, aka Project Y. He began the presentation by describing what the organization FIRST is and what FRC does to promote STEM education by making robotics a sport. FIRST stands for For Inspiration and Recognition of Science and Technology. FRC is a team based robotics challenge, where the team has 6 weeks to build a robot from scratch that does specific tasks for a competition, while being restricted to some design constraints. At this point Andrew Erickson invites two members of the robotics club leadership team members, Kai Coblentz and Sophia Li, to talk about their personal experiences on the club and the specifics of the team. Some of the design constraints include a weight limit of 120 pounds, and restricted frame perimeters and dimensions. Once the robot is built, the team competes in various competitions, just like a regular sport. The team building and diversity that results from FRC has greatly benefited all of the members. 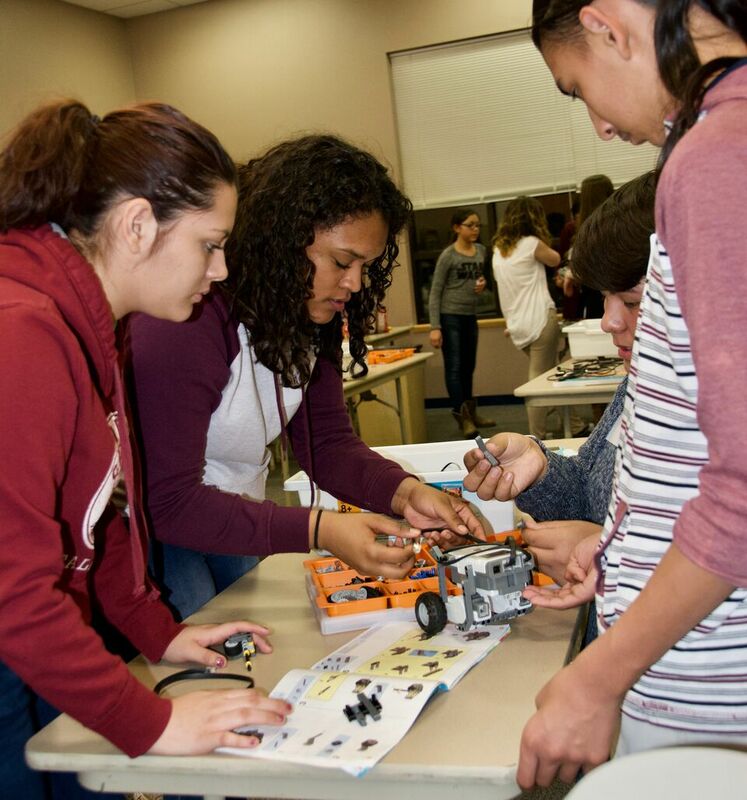 FRC teaches high school students about the engineering processes involved with making a robot, including all auxiliary positions necessary to make a club function. 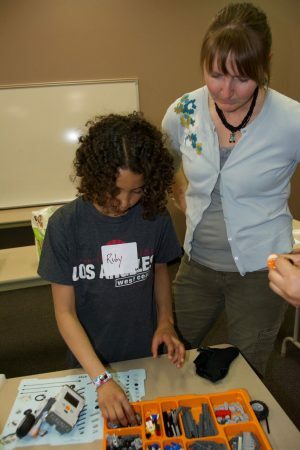 The hands on activity was aimed at demonstrating how difficult it is to design and program a robot given certain time constraints. The activity took exactly 60 minutes and consisted of creating and programming a robot that follows a predetermined line track. The robotics kit used was NXT Legos and programmed using Lego Mindstorms software. There were a total of 5 table groups, each of which was provided with a full lego kit and a computer with which to program their robot. Each robot group had two motors and one light reflectivity sensor in order to follow the line. The program that would successfully follow the line would have to incorporate while loops and switch loops. In general, NXT is the simplest way to build and program robots for beginners. It effectively teaches a student about basic programming principles and engineering processes. The group with the fastest time was 4 minutes and 20 seconds. Overall the cafe helped to inspire the students about furthering their careers in STEM fields.